On 24 December 1977, in Thrayee Brindaavan, the Sai (Eeshvara) Gaayathree was revealed by Swami to Ghandikota Subrahmanya Shaastri, doyen of Vedhik learning, culture, and practice. 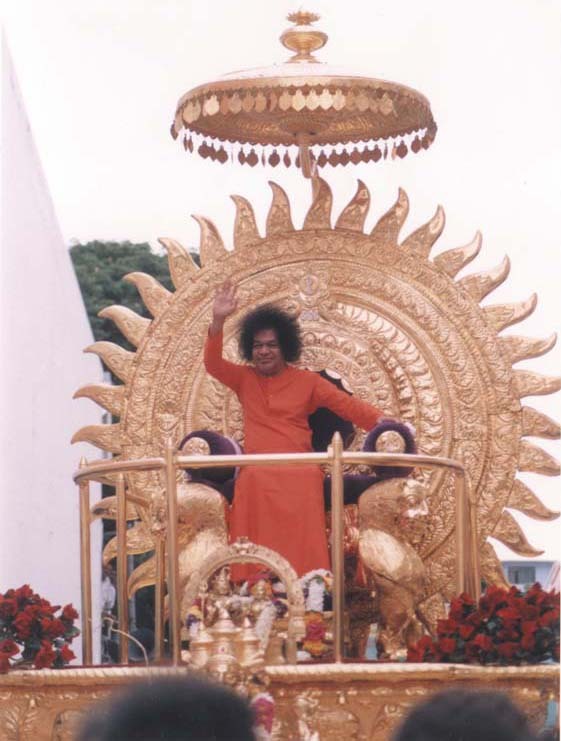 On 15 February 1999 the Sai Hiranyagarbha Gaayathree was revealed to Ghandikota V. Subba Rao, during Mahaashivaraathree. The last line of the Sai Hiranyagarbha Gaayathree was actually first said by Sathya Sai Baba, as Subba Rao was struggling to complete the Gaayathree. It was Sathya Sai Baba Himself who coined the term "Saithree" for these three Sai Gaayathrees. The three Sai Gaayathrees, with translations, are presented below. Subba Rao chanting it Om. We know this Sai as supreme divinity incarnate. the path of total liberation. We know this Self-shining Entity. We meditate on this Golden-wombed divine personality. us on the path of liberation. Sai Eeshvaraaya Gaayathree serves as a bridge to the divine cosmic life Principle of Eeshvara. It is related to the deepest Super consciousness in us all. The best time to chant this Gaayathree is 4AM to 10AM. Sai Suurya Gaayathree relates to the body level in cosmic form --Suurya is the Sun God. It is related to consciousness in the outer world. The best time to chant this Gaayathree is 10AM to 4PM. Sai Hiranyagarbha Gaayathree enables us to link with the divine cosmic Mind, Hiranyagarbha (Golden-wombed Divinity). It is related to the subconscious-psychosomatic conscience. The best time to chant this Gaayathree is 4PM to 10PM. A yanthra, or chakra, is a geometrical diagram used like an icon in meditation or worship of a deity. It is a potentised diagrammatic inscription of letters/words pertaining to that deity. 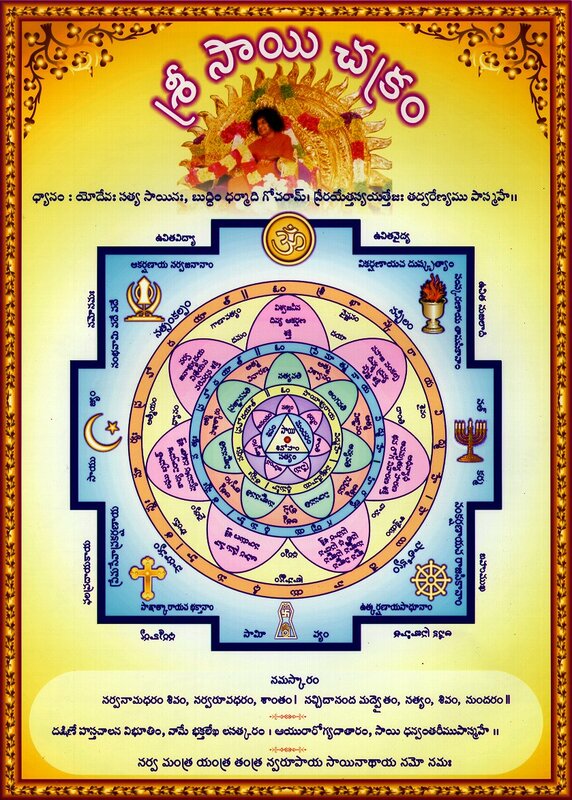 The Sri Sai Yanthras shown below were created by Ghandikota V. Subba Rao. They are actually the same yanthra but in different languages: Sanskrit using the roman alphabet, Sanskrit, and Telugu. Click on a small photo to see a larger version of it --each is about 320KB. 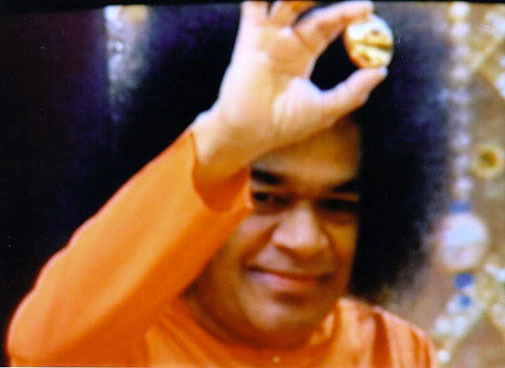 In his booklet "Saithree", Subba Rao explains that this yanthra came to him at early dawn on Monday, 11 October 1999, and that Sathya Sai Baba blessed it three times that same afternoon, after discussing its contents with Subba Rao. We draw a few details from that booklet, but you will get much more out of the booklet itself. This explanation deals with the yanthra that contains Sanskrit in roman letters. The mode of worship of internalizing this Sai Chakra, or Sai Yanthra, and firmly installing it within you is called the Sai Thanthra. 0. General structure. Divine yanthras are generally enclosed by a square, which is called the Apex Spiritual City; it constitutes the universal stage where the play of the individual, collective, and cosmic forces are at work. The dot at the centre is the nondual, monistic, five-lettered (in Sanskrit) holy formula for deep contemplation, SAI SHIVOHAM (I AM THIS SUPREME UNIVERSAL FORCE, SHIVA SAI). It is enclosed by a triangle, whose sides represent Truth, Goodness, and divine Beauty. These three spiritual illuminating impulses radiate outward and sanctify the whole Sai spiritual field, or Sai Mandala. This Sai Spiritual Terrain between the inner triangle and outer perimeter of the square has three circles, within which are the three Sai Gaayathrees. Note also that there are nine enclosures, each containing Sai principles. We now explain these, from the outer to the inner. 1. Seven-fold mission. Closely following the sides of the perimeter, the square, are the seven-fold missions or purposes of the Sai Avathaar (e.g. Aakarchanaaya Sarva Janaanaam in the upper left). These are (1) drawing all people by His magnetic power of universal love, (2) weeding out wicked qualities by His loving kindness, compassion, and grace, (3) reforming the inactive and ignorant and lazy, (4) rechanneling the energies of the selfishly active and passionate people, (5) elevating the good and noble to ever higher levels of spiritual consciousness, (6) Bestowing direction vision of the Lord on true devotees, and (7) manifesting by His own example the principles of selfless, loving, egoless service to the needy. 2. Swami as the universal embodiment of all religions. This concept is symbolized by the symbols of seven different religions. Clockwise, starting at the upper right, we have: (1) Zoroastrian flaming fireplace, (2) the Jewish menorah (with seven candles), (3) the Buddhist wheel, (4), the Jain outstretched hand bearing the word ahimsa (nonviolence), (5) the Christian cross, (6) the Islamic crescent and moon, (7) the Sikh double-edged sword surrounded by a wheel held up by a sword on each side. At the top is the Omkaar, or Pranava, standing for both the immanent and transcendental aspects of the Supreme Spirit --this is why it lies partly outside and partly inside the chakra. This is the symbol of the Sanaathana Dharma, the Ancient Eternal Universal Religion, in which all other religions are "sourced". 3. Seven steps to liberation. Between the religious symbols and the first circular space are the seven steps to liberation (e.g. Sath Sankalpam near the Sikh symbol at about 11 o'clock). These are: (1) good resolution, (2) good company and character, (3) good deeds, (4) living a spiritual life, (5) living in close proximity to Divinity, (6) experiencing divine nature and bliss, (7), becoming one with the Divine. Sai Suurya Gaayathree. 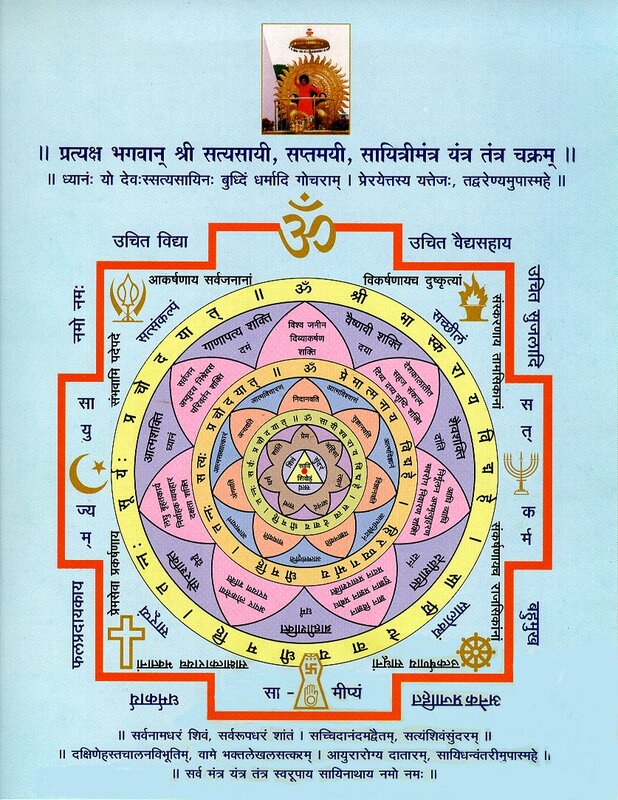 The Sai Suurya Gaayathree is in the first circular space. 4. 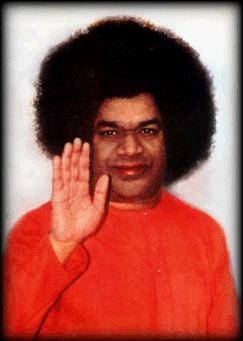 Seven miraculous powers of Sathya Sai Baba. The seven miraculous powers are just within the outer circle (e.g. 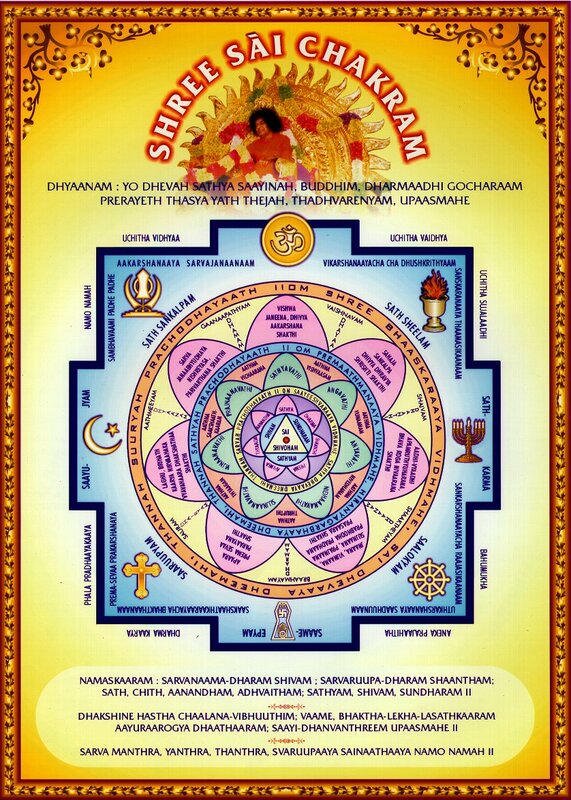 Vishva janeena dhivya aakarshana shakthi at the top center). The powers are (1) magnetic miracle of universal love, (2) materialisation miracles, (3) medical miracles, (4) metaphysical miracles of teachings, preachings, and reachings, (5) miracles of public service (e.g. free medical services), (6) miracles of micro and macro management, (7) man-making miracles --reforming and transforming vast numbers of people for spiritual progress and welfare. 5. Seven divinities with their respective powers. These seven divinities and their powers are above the seven petals, closely following the inner perimeter of the first circle (e.g. Gaanaapathyam at about 11 o'clock). They are (1) power of intellect, (2) power of right action, (3) power of nondual, unifying knowledge, (4) power of universal divine love, (5) power of beneficial creative activity, (6) power of vital sacrifice, (7) power of supreme Aathma, or Self. 6. Seven-fold moral disciplines. These disciplines are written just under and perpendicular to the powers in number 6 (e.g. Dhamam is under Gaanaapathyam). They are (1) control of outer senses, (2) kindness and compassion, (3) mastery of inner senses, (4) giving, sharing, caring, serving, (5), righteous altruistic service to the needy, (6) courage with self-confidence, (7) contemplation and meditation. Sai Hiranyagarbha Gaayathree. The Sai Hiranyagarbha Gaayathree is inscribed in the second (middle) circle. 7. Seven-fold stages of self awareness and realization. These stages are just inside the second (middle) circle (e.g. Aathma Vichaarana at about 11 o'clock). These stages are (1) self awareness through self inquiry, (2) developing self confidence, (3) acquiring wisdom of the Self, (4) living in self surrender, (5) gaining self-satisfaction, (6) selfless self-sacrifice, (7) reaching the state of bliss in self realization. 8. Seven-fold paths to Braahmik consciousness. These paths are inscribed on the petals between the middle and inner circle (e.g. Sathyavathi at 12 o'clock). These are (1) the quest for truth, (2) contemplation of the Divine in its partial manifestations in nature (e.g. the five elements), (3) contemplation of the Divine through symbols, idols, pictures, etc., (4) devotional self surrender, (5) acquisition of knowledge of God, nature, and man, (6) experience of unit in diversity and contemplation of "Thou are That (Thatvamasi) ", (7) experience of the truth of "I am Brahman (Ahambrahmaasmi)". Sai (Eeshvara) Gaayathree. The Sai (Eeshvara) Gaayathree is inscribed in the third (inner) circle. 9. Seven-fold Sai values and principles. These values and principles are inscribed in the petals within the inner circle (e.g. sathya at 12 o'clock). These are (1) truth, (2) righteousness, (3) peace, (4) divine love, (5) nonviolence, (6) service through sacrifice, (7) bliss. Three principles of truth, goodness, beauty. These principles are on the three sides of the inner triangle (e.g. Sathyam). The nondual formula "I am Sai Shiva (Sai Shivoham)". This aphorism appears inside the inner triangle. Unbroken contemplation of this aphorism will result in liberation. A thanthra is a mode of worship, a spiritual technique, a ritual or method for spiritual progress, a manual of worship. the Sai Thanthra consists of (1) Steady contemplation of the truths contained in the Sai Chakra, particularly the three Sai Gaayathrees; (2) continued performance, with devotion, of one's duties and obligations and of selfless service to the needy; and (3) living a life filled with love, service, and bliss, in constant integrated awareness of the all pervasive supreme Reality. 1. Body-related transformation. Namaskaar --offer salutations by joining both hands (and prostrating, if you wish) before the altar of the Sai Chakra. To be repeated three times, while repeating the verse given below to seek Swami's grace. 2. Senses-related transformation. Aavaahana (invocation). invoke or install the Sai Chakra or Yanthra in the heart by a gesture of turning the palms inward toward the heart area. Mr. Subba Rao gives a verse (see below) to be repeated while doing this. To be repeated three times. 3. Mind-related transformation. Dhyaana (meditation). Meditate in the heart in silence, with even breathing, while dwelling on the meaning of a verse (see below). 4. Intellect-related transformation. Chant the Sai Suurya Gaayathree seven times; perform abhisheka while doing this --sprinkle drops of water on altar of the Sai Chakra. 5. Inner-conscience transformation. Chant the Sai Hiranyagarbha Gaayathree seven times; while doing this, place flowers on the altar of the Sai Chakra. 6. Ego-complex transformation. Chant the Saayeeshvara Gaayathree, while placing fruit as an offering before the the Sai Chakra. 7. Total unitive transformation. Contemplate on the meaning of Sai Shivoham (I am Sai Shiva); then do aarathi --wave camphor light in a clockwise direction three times in front of the altar of the Sai Chakra. Purport: We contemplate on Shree Sathya Sai, who holds in His left hand a big bunch of letters collected from devotees seeking His divine grace to cure their illnesses of body, mind, intellect, and ego; and, at the same time, creates vibhuuthi (sacred ash) merely by waving His empty right palm and distributes it to the needy and suffering. May this Sai Dhanvanthari (divine doctor of doctors) bestow on us health and longevity. Purport: Let the effulgent energy of Shree Sathya Sai, which pervades my heart as pure consciousness, inspire, guide, and actually direct my senses to perform dhaarmik or altruistic service activities with selfless love. We meditate on this self-effulgent divine Personality. Purport: This Shiva Sai bears all names. He is the very form of peace. He is the embodiment of the nondual principle of Being, Awareness, Bliss. He is the Shiva Shakthi characterised by truth, goodness, and blissful beauty.